Learn the techniques used in watercolor painting: drawing, mixing colors, types of papers, wet on wet, dry brush, spatter, negative painting, experimental scrapings, layered, etc. 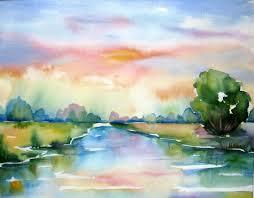 to give you a working knowledge of watercolor. Bring a drop cloth. Supplies needed: Any general watercolor kit and watercolor paper pad 9x12 or larger.